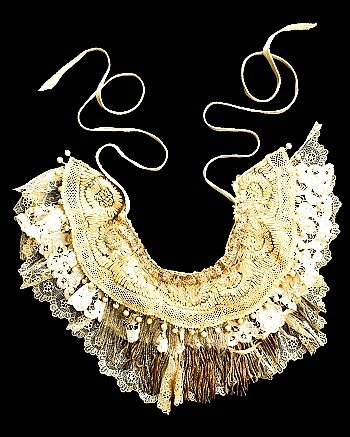 The purposes of the group are manifold, including to explore new methods of beading, to experiment with variations on traditional techniques, and to study culture-specific beading techniques. Bead Study meets the 1st and 3rd Wednesdays of every month. Anyone may join our group at any time. may continue the discussions on line on our blog or in the yahoo beadstudy group. Summaries of all discussions and all handouts are archived here for you, as well. Classic Art Theory holds that if, when talking about a piece, you talk or focus too much on ‘technique’, your piece is not Art. It’s Craft. Craft is seen as having nothing to do with aethestics. It is merely a creative engagement with materials. With paint, the technique to apply it, is seen as virtually irrelevant. What matters with painting is what it says, not how it was made. If the sense of ‘technique’ supercedes an object of art’s ‘statement’, then the art is really craft, thus a failure… and an embarrassment. Craft is an affront to art. Art is exploring the expressive qualities of the medium, stoking the imagination of its audience. In fact, crafters supposedly do not play to an audience; art does. Can you speak about beadwork or jewelry making without speaking about technique? Why are people willing to pay $1,000 for a painting but not $1,000 for beadwork? We talked about issues of presentation and timing. Beadwork often not shown at its best. Where is the play of ideas in the craft world? What we do as crafters seems divorced from theory and the inherent qualities of the materials which we use. We follow a set of instructions or procedures. What are the venues for advancement in our field? No academic programs. Few magazines, no journals. We often are disappointed in the pieces shown in Bead & Button, yet B&B is often the primary face to the world of what we make and do. Hobbyists tend to be a very passive group in social terms. Unwilling to push the envelop with the craft. Backing down when their work is challenged by artists and art critics. Willing to accept the identity of “amateur” artist. How does the beader/jewelry maker stoke the imagination of their audience? Classic Art Theory: There is something special about the artist. There is nothing special about the craftsperson, though admittedly, they show technical skills. Is there something special, besides technical skill, about the craftsperson? To what degree should the “process” enter into the evaluation (and legitimation) of the finished piece. Classic Art Theory differentiates between ‘technique’ and ‘skill’. Skill is seen as the capacity to control manually any risk for bad workmanship. Artists accomplish a task successfully. That is, there would be no signs or minimal signs of bad workmanship. What parallels are there to this bread analogy that relate to beading and jewelry making? Situation: You follow a pattern of instructions in a book. Situation: You improve upon a particular design from a book. WF interpretation: It is the process of linking the technique to the materials that is “art”. A successful process requires an understanding of the intrinsic values of the materials. It requires an understanding of how to manipulate the materials to elicit a positive response from others. It is expressive, intuitive and evokes emotions. The critical focus is not on the techniques. The critical focus is on the linking of technique and material to create something that others emotionally interact with. In what ways can we link our techniques to the inherent qualities of the bead? We discussed a little bit about the Peyote Flower from our text. We’ll continue with the Peyote Flower next time. This is the end of the more esoteric series of discussions we’ve had. As we continue through our text, we’ll work more on applications. 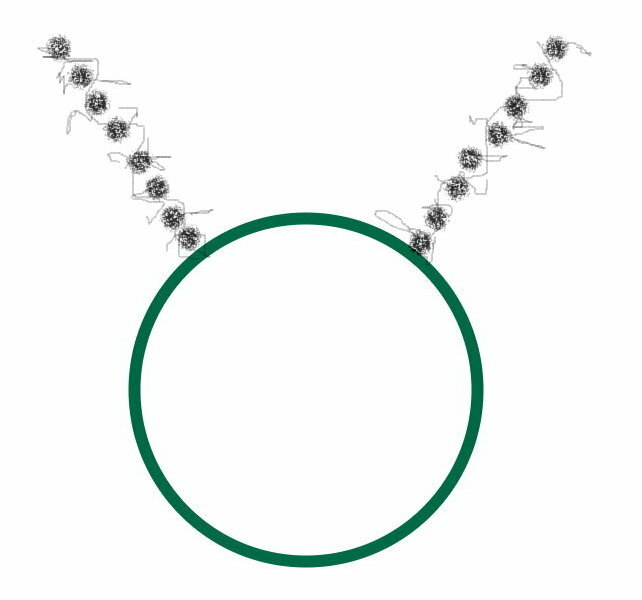 Toward this end, everyone will need to create a 30″ necklace of this general design. Here I’ve used 8mm flat discs (czech glass) and 11/0 seed beads (miyuki). This piece is constructed as a series of circles. [You can use 8mm round beads or shapes, whatever you like, instead of discs.] In this case, I am adding 5 11/0 beads, then the 8mm disc, then another 5 11/0 beads, and making a circle. I repeat the circle to reinforce and tighten. Then I add another 5 11/0, an 8mm disc, and 5 11/0, and circle twice, and so forth. 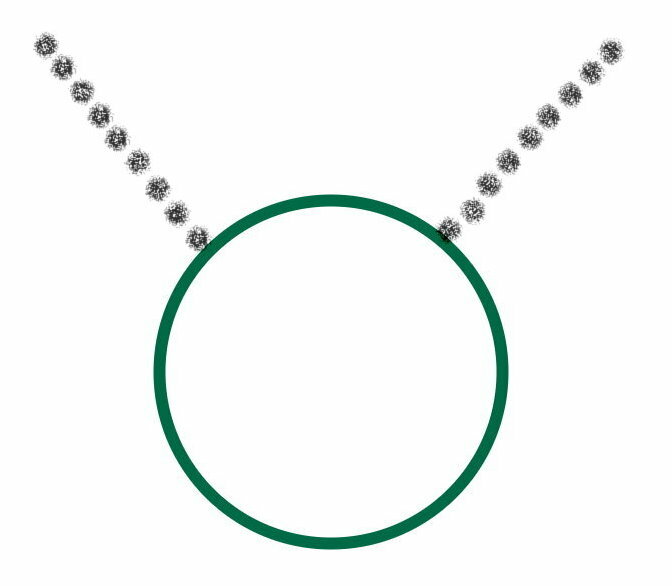 After you’ve made the 30″ necklace (no clasp), you are to use the two lines of 11/0’s and add fringe off of these. You can create a pattern. You can do something randomly. You can experiment. You can base your fringe from things learned with our flowers and leaves from our text. Or follow some other strategy. We’ll discuss the pros/cons/implications for your various fringing strategies. We’ll also use your developing piece to discuss issues related to straps. A canvas may be defined as a surface to work upon. For a painter, this might be a stretched canvas, or a piece of material or a piece of wood, a wall of a building. – the stringing material : thread, cable wire, bead cord, sinew, leather, etc. From the viewpoint of Classic Art Theory, the viewer is NOT meant to appreciate the canvas as a depiction of anything. The canvas should not be a part of the composition. It should not elicit emotion or reaction. It should not affect perceptions of the piece. DISCUSSION: To what extent do you agree with Classic Art Theory, when it comes to beadwork and jewelry? With jewelry, the color of the thread has an impact; it’s stiffness. Sometimes you want the stringing material to show, like when putting knots between beads. What needs does the canvas serve? How should the “canvas” interact with the main piece? To what extent should the canvas been seen? Do we want to differentiate between viewing the piece close-up and viewing from afar? How do you coordinate the “scale” of the canvas to the rest of the piece? How does the bead artist create something of visual depth and 3-dimensionality off a flat surface? Do you embrace the canvas or defy it? As soon as the bead touches the canvas, the canvas changes. Classic Art Theory would suggest that the bead artist should always pick a color of thread to match the predominant color of the beads. Would you support this rule? We also discussed the square stitch flower from our book. Does the regularity and squareness of this stitch have a different satisfying effect on the flowers, than the ndebele or brick stitch flowers we’ve done previously? Classic Art Theory holds that if you have to talk about technique, then your piece is craft, not art. Here the art critic equates “beads/beadwork” with the canvas of a painting, and not the painting itself. To the critic, beads are merely decoration. In this point of view, it is impossible to use beads in any way so that the finished project would be seen as art. How can you use beads so that the finished project is seen as art? How do you NOT use beads so that the finished project is seen as art? To this reviewer, art is associated with clarity of choice and purpose, a sense of presence, and the evoking of an emotional response (or unleashing psycholgical content).” To this reviewer, these kinds of things are not associated with beadwork and jewelry. In fact, to this reviewer, they can never be. Thus, beadwork and jewelry are not “art”. – show restraint — edit, edit, edit. Too often beadwork/jewelry has too much or too little. Tendency to overembellish everything, or get to repetitive with the elements and materials. Discussion: The Tennessean newspaper in Nashville refused to cover anything not fine art in their art pages. The Frist Center refused to display bead art, saying they didn’t see the audience. Hardly any museums across the US recognize beading/jewelry making as art. People need to be educated about beadwork and jewelry design, and why it is valid art. But how do you educate them? What words do you use? Many galleries and art critics only recognize the art of those artists with formal credentials. The reputation of the schooling of the artist is directly related to the judged “artistic” value of their work. There really are very few academic programs in beading/jewelry making. These are mostly involved with technical training, rather than theory and investigation. There are no professional journals where ideas and theories are proposed, discussed, tested and proven. In this model, beaders/jewelry makers stand little chance of getting judged as true artists. In this sense, making a distinction between craft and art, or trying to blur the distinction between craft and art, becomes irrelevant. Within this definition, a lot of what gets sold as beadwork and jewelry, which many people would not value as “art”, will get included within the concept. When a piece can get labeled as “art”, and retain this label, it becomes more valuable. It can sell for more. More people will indicate that it is good, rather than not good. It (and the artist) have more power. Jewelry is seen as visual spectacle. There are no self-reflective qualities to jewelry. There is no artist’ hand involved in its creation. Discussion: It seems that the more beadwork mimics painting or sculpture, the more it gets acceptable as “art”. A beaded tapestry or a beaded art doll is much more readily accepted as art, than jewelry. We talked about the work of Joyce Scott and David Chatt, and their validation as “artists”. Somehow, we must be able to recognize how the artist conceived of the piece, and how the artist implemented his/her conceptions. How did the artist test the limits of the materials — in this case, beads? How did the artist exploit the possibilities through the use of beads? How did the artist compose and design the piece? Discussion: Within this framework, all the parts of the jewelry — the center piece, the fringe, the strap, the bail, the surface embellishment — are critical to the appreciation of the jewelry as an object of art. Each of these elements of the piece of jewelry require the artist to exploit the possibilities of the material — the beads. Only with this fuller understanding of the piece in its entirety than Classical Art Theory would allow, can the artist, through the jewelry, create something where the whole is more than the sum of its parts. And this, then, is jewelry as art. Within this framework, the fringe and edging and bail and strap and surface embellishment are not equated to the frame of a painting or the pedestal of a sculpture. They are not supplemental. They are as critical to understanding and appreciating the piece of jewelry as art. We reviewed the Brick Stitch Basic Flower and ideas about relating the flower to fringe. And we had an indepth discussion about straps. Classic Art Theory would view the strap in similar ways as it views the frame to a painting or a pedestal to a sculpture. The strap should be supplemental to the centerpiece. It should not compete. It should be seen as separate from and different from the center piece. It is seen as an embellishment to the piece. It is not seen as art. Using some pieces we had on hand created by Susi, Ingrid, Dagmar and Cecelia, as well as references to pieces all of us had done, we worked through the following discussion points. 1) What if the strap is the “artwork”? 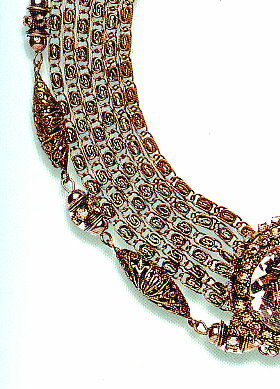 Often the bead-woven strap is the “jewelry”. To what degree should and could it stand alone as a piece of art? Susi had her Celini Peyote Spiral Necklace completed. 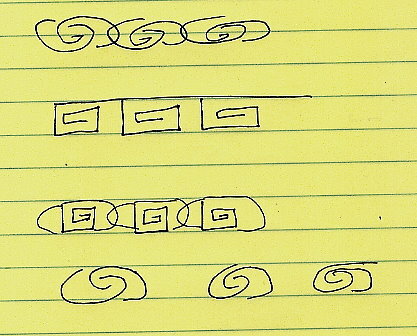 At the mid point of the piece, she created a V-form, and reversed the spiral directions. The question: should she add a centerpiece, and/or any other type of embellishment? If she made any particular change, would it make the strap more or less satisfying as a piece of art? Artistically, some felt a small center drop would enhance; others detract. We debated added some fringe, or adding some surface embellishment towards the center of the piece. Functionally, there was a concern that when worn, the piece would adjust itself so that the V-element would be off-centered or not displayed correctly. In this case, a centerpiece could add some counterweight and positioning functionality. There was lots of discussion about It Depends. It depends on what the person is wearing the piece with. From an art theory standpoint, any issue with “wearing” is irrelevant. The piece is to be judged as if it were sitting on a mannequin or easel. From a Design Theory standpoint, a piece an only be judged as a work of art as it is worn. From a craft perspective, the piece cannot be judged as art at all. To what degree should the strap be subordinate to the centerpiece, and to what extent should it be something more? Is the answer dependent on personal taste, current fashion and style, functionality and nothing more? Or are there some art theory considerations here? One major weakness of art theory as it applies to jewelry, is that it is often difficult to separate the identity of the strap relative to the whole piece, from the identity of the whole piece itself. Should these variables matter in the design of the strap? If so, how. Strap attached to center point at top of centerpiece. 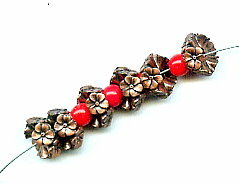 Strap is linear, and may be a chain or line of seed beads. Strap attached to 10 and 2 o’clock positions on center piece, or runs through the piece itself, or runs through loops on the back of the piece. 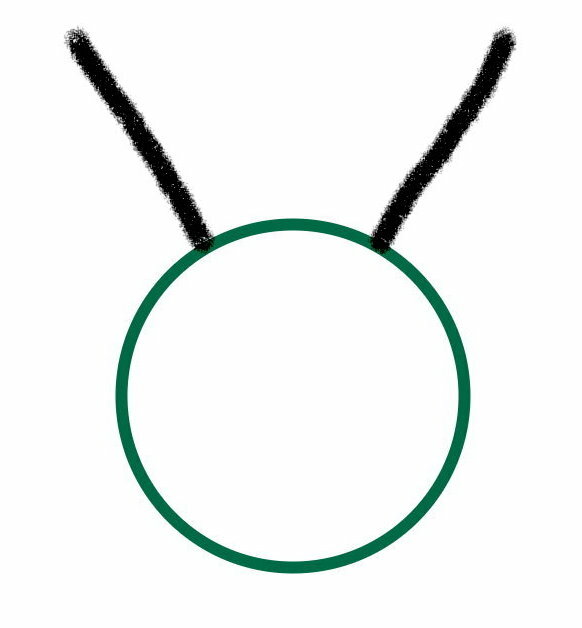 Strap is linear, and may be a chain or line of seed beads. Strap may be linear, but more complex and more hand-crafted looking, such as spaced out beads. Strap may have a chain running around and through the beads, and may have some fringing and embellishment. 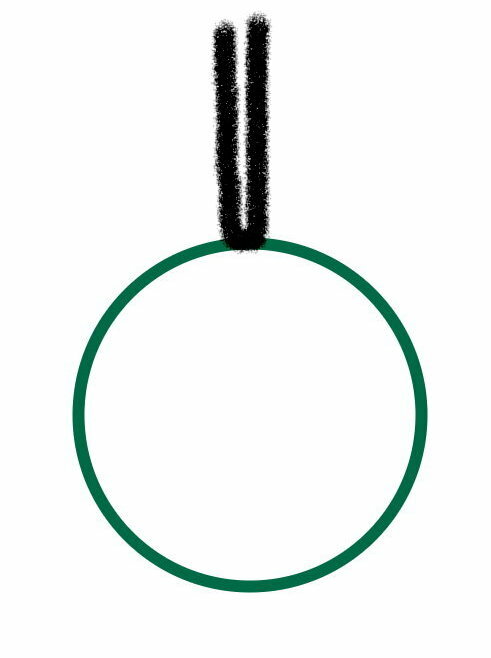 An additional element may intervene, in this case, a bail, comes between the centerpiece and the vortex of the strap. 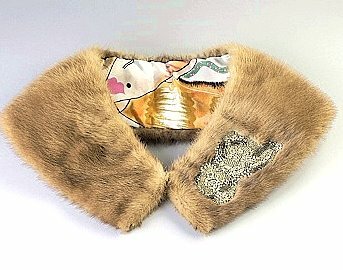 The strap may be twisted, or very elaborately and extensively embellished. Thicker strap. The strap may seem oddly placed. Perhaps this person would be seen to be wearing a sign around her neck, instead of a piece of jewelry. Many current styles coming out of New York show an outsized or oversized centerpiece with some kind of strap to allow this centerpiece to be worn around the neck? The question: why would the jewelry artist so diminish the artistic stature of the strap, to overemphasize the centerpiece? – artist is rebellious in some way. 3) Where do you position the strap relative to the piece? Does the positioning of the strap relative to the piece make it more or less satisfying as either the work of art, or as the piece supplemental to the centerpiece as the work of art? How does the addition of some kind of bail affect the identify of the strap, the centerpiece, and the jewelry as a whole? 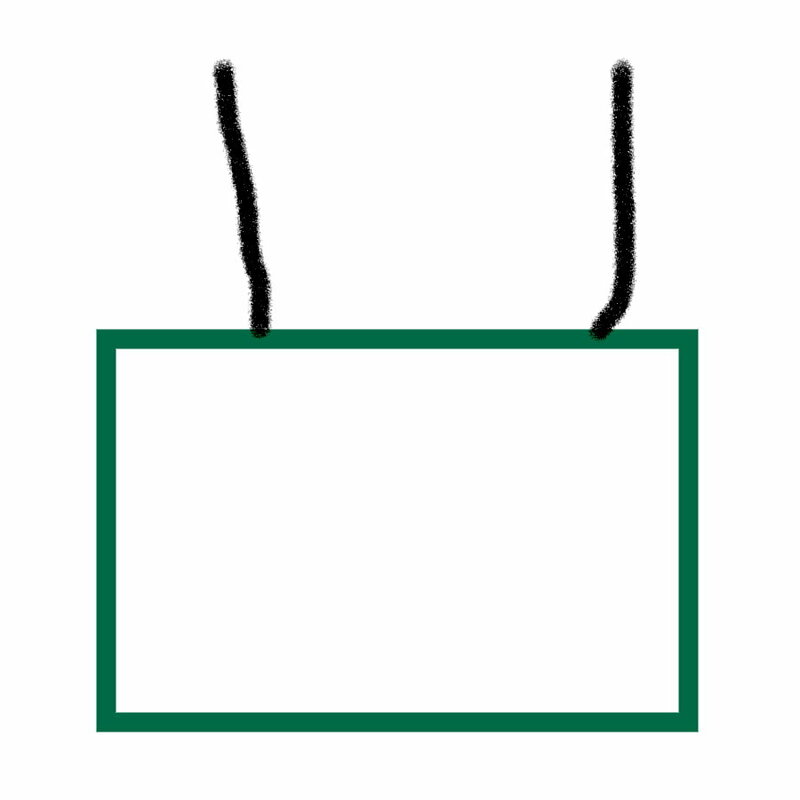 Should the strap get attached to the piece on its edges? Should it get attached going through the piece itself? Should it run through the back of the piece? 4) Can you ignore the Functionality of the Strap, for the purposes of Art? The strap has to hold the centerpiece up. It has to lay well. It has to coordinate with the clothing the wearer is wearing. It has to control the boundaries between the center piece and itself. It defines a silhouette on the body. Because it plays so many important functional roles, does this fact deny its place as Art? Does it mean it should never be seen as part of the jewelry judged to be art? 5) A bead woven strap can often take as long to make as the center piece itself. Given all this work, and if you are selling your piece, how much more you have to charge, because of the strap, shouldn’t the goal for creating a strap serve Art Theory purposes? A strap that is not seen as Art sure has a lot of time and sweat and tears put into its creation — again, often equal to the time and sweat and tears put into the centerpiece. Warren shared the fringe ideas associated with our first group of flowers — the herringbone stitch flowers. One of the petal variations lent itself to a very 3-dimensional fringing effect. Modern contemporary design values 3-D and values some movement, and this particular variation, with minor tweaking, could be very effective as a fringe. The assignment for today was the herringbone lily flower. To translate some of this flower into fringe, the fact that you could bend back the tip of the flower would make for an interesting fringe effect. Today we continued our discussion about fringe, edge, strap and surface embellishment. Our focus today was on EDGES. What role does the “border” of a piece play? Does it mark a beginning/ending? How does it help the viewer appreciate the emotional content of the piece? They may repeat the pattern of lines and arcs from the central piece. They may establish a rhythm. 1) A customer of ours repairs antique beaded purses. She brought in a piece that had many beads missing on the body of the purse. Part of the edge had size 8/0 seed beads sewn along it, most likely to hide the seam-threads, and perhaps to add to the artistic look. The two bottom corners did not have any edge beads. To me, this bothered me. One corner looked like it had been chewed by a small animal. To me, the whole edge of the purse needed to be beaded. The edging was done with a single layer of size 8/0 seed beads. It could have been some wider/longer fringe, as well. 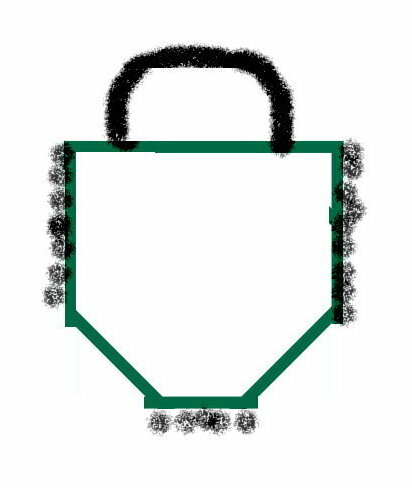 This edging, of course, as it got more prominent, might start to compete with the beaded images on the purse itself. Sometimes leaving the zipper as is along the edge doesn’t bother me. Othertimes, it does, and I add an 15/0 seed bead along the edge to get it more even. For a peyote stitch bail I had recently made, I added 15/0’s along the edge. The bare zipper edge bothered me. Ingrid had made a bead woven scalloped donut pendant, and put it on a rope chain. 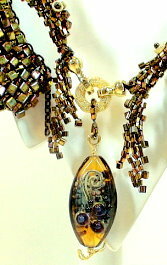 She felt she wanted a bead-woven strap, and one that was thicker, in order to compliment the pendant. We discussed how this may or may not make a difference. We talked about the edge of the donut pendant. We felt it’s curvature and use of color created a subtle yet satisfying edge. We felt adding a traditional 3-bead picot along the edge would cheapen things up. The bead bezel enhances the cabochon stone and its markings. Adding an additional framing around the beadwoven bezel enhances the bezel. Adding fringing on the frame around the beadwoven bezel enhances the piece even more. However, not enough fringing or too much fringing starts to make the piece look worse. Edging is important when it enhances the viewers emotional interaction with a piece. It may focus the viewer’s eye. It may serve to help the viewer interpret the transition from the piece to its surroundings, as the piece is worn. Classic art theory requires that this edging be supplemental to the piece. To what extent we adhere to this theory in jewelry design, is what we are discussing and debating. Do the first set of brick stitch flowers. Try creating some fringe, using one or more petals from each brick stitch flower. In our Bead Study group, we began a unit on learning what I call “turns of the needle” techniques. These are small, bead-woven shapes and forms that you make with seed beads and needle and thread. You can adapt these shapes and forms to use as edging, surface embellishment, straps and fringes. We are practicing each shape and stitch, and playing with these. 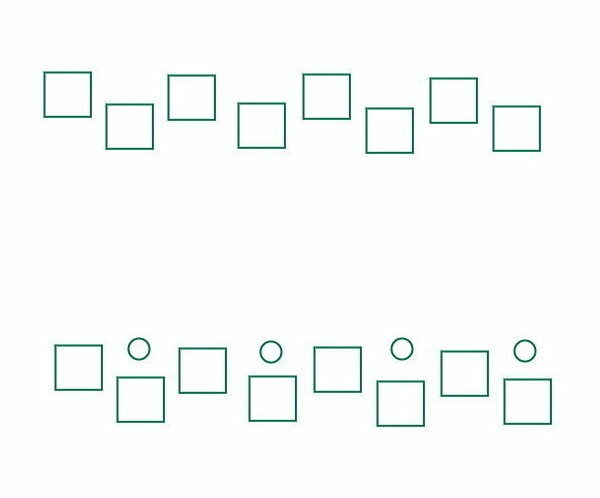 How can we adapt these simple turns-of-the-needle to use in edges, fringes, straps and surface embellishment? That’s the crux of our work over the next few months. These are the kinds of elements in jewelry which beaders tend to over-do, making their pieces more crafty and less arty. But if we are to get control of what we make as artists, how do these elements come into play in an appropriate and satisfying way? 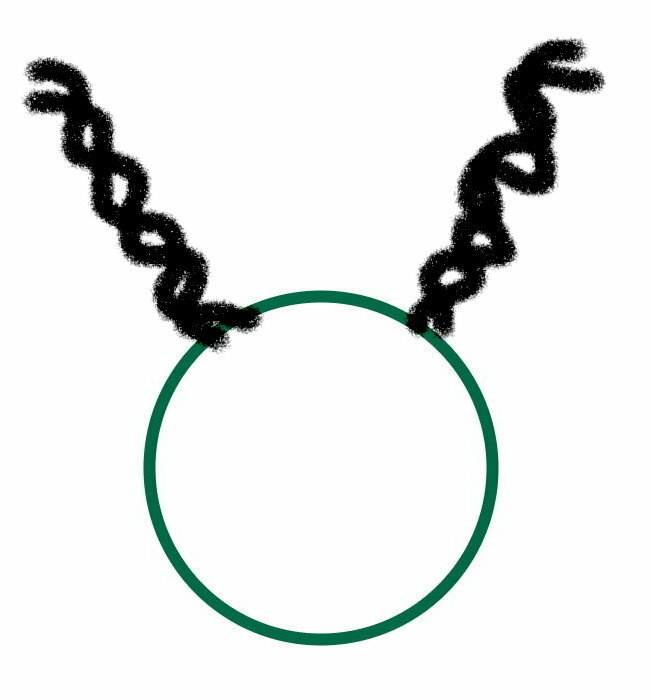 Classical art theory would say that these kinds of elements in jewelry — fringe, edge, strap, and surface embellishment — should be supplemental to the core piece, such as a pendant. 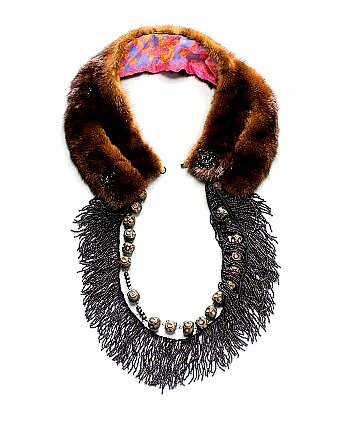 The pendant is “art”, and any fringe, strap, edging or extraneous surface embellishment would merely supplement this. In painting, these kinds of components would equate with the “frame.” In sculpture, these kinds of components would equate with the “pedestal base.” Neither the frame nor the pedestal should be required to appreciate the painting or sculpture as art. Nor should these detract. Or compete. Or take center stage. Or overwhelm. 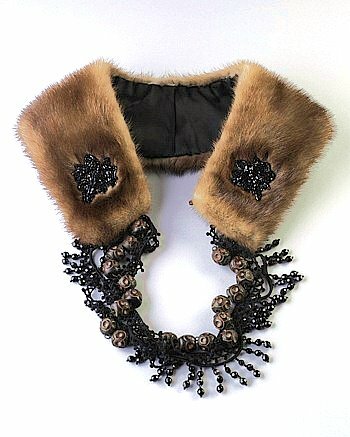 If our goal is to elevate beadwork and jewelry to the realm of art, rather than craft, we need somehow to accommodate, confront or revise this concept which is central in art theory, if we don’t agree that edges, fringes, straps, and extra surface embellishment are as important to the jewelry as it’s core. Should these be supplemental, or complimental, or incidental, or critical to jewelry? Is adornment and embellishment “art”? What makes a piece of jewelry an “art” piece? Is there a design element to creating fringes, edges, straps and surface embellishment? That is, are there a set of principles that we can follow and share, so that we don’t over-do, or don’t compete with the central part of any piece of jewelry? Are there a set of rules of construction that we can learn and adapt? What is the value of decoration? What principles regulate this? Ornament Magazine , one of my favorites, uses the image below in their promotional materials. I love this piece as is, but, based on our bead group discussions, the piece begs the question whether the fringing and straps are helpful or hurtful to the core piece. Appropriate or inappropriate? Dragging jewelry back to a craft-base, or elevating jewelry into an art-form? Bring a Pot Luck dish. Bring a gift for our Dirty Santa game. Dagmar shared her first attempt at creating a Greek Key Pattern chain. She used hard wire as the stringing material, in order to keep the spiral shapes. Dagmar agreed to moderate a once a month open session, where people can come together to work on a project each month out of one of the bead magazines. There would be no fees for this. This open session would be held on a Saturday afternoon. Let Warren know if you would be interested in attending. The date of our bead study group holiday party will be Wednesday, Dec 9th, from NOON to 2pm. The party is pot luck lunch. Everyone also needs to bring one gift for our Dirty Santa Gift Exchange. Let Warren know if you will be attending, and what type of food you will be bringing. 2. 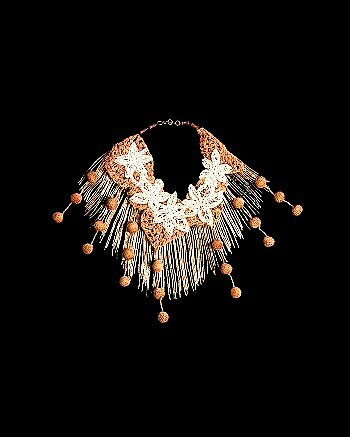 Using seed beads and/or delicas, try to recreate the flower pattern in this Miriam Haskel necklace. What you are seeing in the image are 3 flowers, somewhat overlapping, and serving as a bead cap. 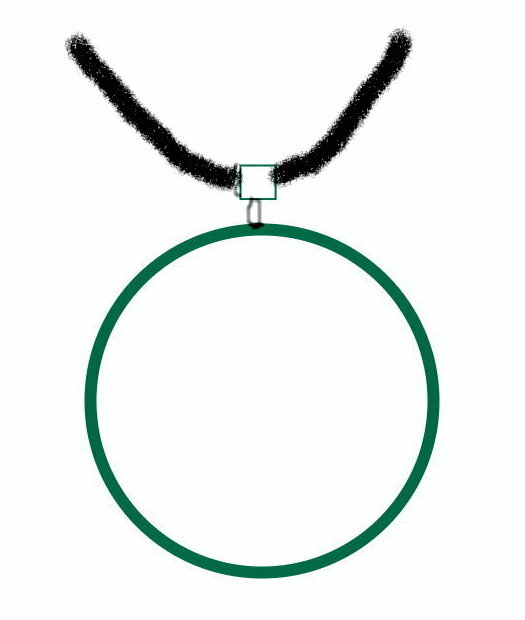 This configuration is surrounding the top and bottom of a 6mm round druk bead. – are the 3 flowers part of a single piece, like in this image below? – or are the 3 flowers three separate pieces that overlap or interlock? You want to create about a 7” long sample, that have the same look/feel as the original vintage piece, where the 3 flowers keep their relative positioning even when the piece is moving, and that is sensitive to the qualities of the color palette in the original piece though your piece doesn’t have to be the same color. 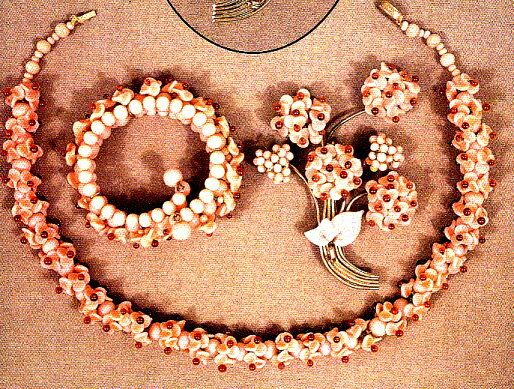 One prominent jewelry artist back then was Miriam Haskell. Diane Fitzgerald has a workshop based on Haskell's designs. You might check out Diane's website for ideas. Another artist of the time goes by Juliana Jewelry. Can we create rules/terms/concepts/strategies for translating design elements in these vintage, costume pieces, into bead weaving terms? Can we create patterns for bead-weaving interpretations of pieces we like? Unlike our studies on Contemporizing Traditional Jewelry, here we want to emulate the pieces and borrow their features. We want to reconstruct the pieces using bead weaving techniques. We don’t want to remake the pieces in modern terms. We want to preserve everything that makes them vintage. Discussion the pieces in terms of design. What does it mean for a piece to have “Great integrity” and to “resonate”? Discussing how the bead weaving/jewelry design goal of “revival” differs from that of “contemporizing”. What does it mean to “duplicate, yet not duplicate” a piece? Today’s task was to begin to categorize vintage jewelry, so that we can then arrange these categories into an overall Taxonomy. The taxonomy shows the arrangement and interlinkages among categories. Today we brainstormed about categories which represent characteristics of vintage jewelry. We talked a bit about Cynthia Rutledges projects from her workshop last weekend, and in particular, how these related to our earlier discussion about Dimensionality. One of her 3-D rectangular donut links, was similar to those of Dianes. But Cynthia used seed beads, instead of delicas, and used 15/0s for the corners (supporting arms) and 11/0s for the fill-in beads. We felt this made the piece more rounded, and sexier, less crafty. In another piece, she did a 3-D circular donut. The circle shape was missing from the various books we had looked at. Cynthia, going around each row, shifts the point of increase. You have to keep shifting the point of increase with each row, and not keep increasing along the linear “supporting arm”. Today’s discussion focused on vintage jewelry and the use of chains. Many chains had a Greek key pattern. Figure out 1 or more strategies for creating a Greek key pattern, using seed beads, bugle beads, and / or delicas. The design challenge is to be able to keep the “key” shape. You can envision this as a series of links. You can envision this as a series of dropped shapes off a line of beads. You can envision this as squared or rounded or triangle shape. Try using a 2-needle approach, where you begin with the center of the chain, and then work towards either end. Try using .012” tiger tail as the stringing material. Tiger tail kinks, so it can keep a shape. 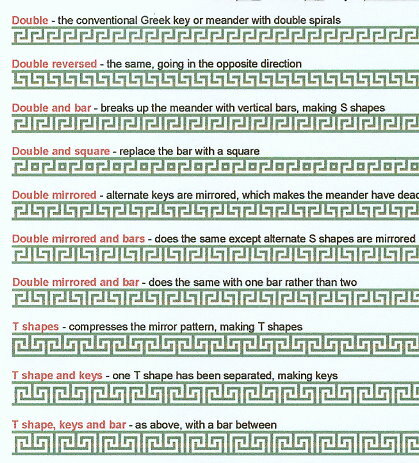 The Greek key pattern is basically a Double-Spiral. Or, you can work both spirals at the same time. A Greek key is a decorative border. There are a surprising number of different versions. Some sample shapes above. There are many, many more. 1. What is attractive about vintage jewelry? 2. What does it mean to “REVIVE” a vintage style? 3. What is the difference between “Reviving” a vintage style, and “Contemporizing” it? 4. Should we keep the old colors, or not? 5. What kinds of materials should we use? the new materials may not be as good or the same as the old materials. 6. A lot of these pieces are very attractive. Why don’t we see these things all over everywhere today? 7. Can we begin to see any themes or universals in construction? We reviewed these books, looking for examples of pieces that we liked, and pieces that might lend themselves, in whole or in part, to bead weaving interpretations. Continue reviewing the books and selecting pieces we like. Unlike our studies on Contemporarizing Traditional Jewelry, here we want to emulate the pieces and borrow their features. We want to reconstruct the pieces using bead weaving techniques. We don’t want to remake the pieces in modern terms. We want to preserve everything that makes them vintage. 2. Discussing these pieces in general, as well as possible bead weaving strategies for interpreting them. 3. Trying to develop a categorization scheme — A Taxonomy in the social science vernacular — to begin to get a stronger handle on design elements, design styles, and design issues underlying these pieces. We want to see if we can get an understanding of color use, ornamentation, sizes, types of jewelry, design elements, techniques. 4. Discussing the pieces in terms of design. What does it mean for a piece to have “great integrity” and to “resonate”? 5. Discussing how the bead weaving/jewelry design goal of “revival” differs from that of “contemporizing”. What does it mean to “duplicate, yet not duplicate” a piece? 6. Working on individual projects to do a bead weaving interpretation of a piece of vintage jewelry. Our current study unit provides a good discussion foil in reference to our unit on Contemporarized Traditional Jewelry we did a couple years ago. Historically, people wore jewelry for many reasons. These included mourning, commemoration, fun, and imitating fine jewelry. When interpreting vintage styles, it is also important to understand the meaning of “revival”. What we are doing is really reviving styles of the past by reinterpreting them, not just in terms of bead weaving, but with recognition about what will look appealing today. In this case, it is useful to look at some of the literature both on jewelry revivals, as well as architectural revivals, and see what we kind find about how some revivals were seen as successful, and others not. It’s not sufficient to duplicate an old piece. Compare the pyramids of Egypt to the Luxor Hotel in Las Vegas. Very similar, yet different. If you were visiting the pyramids in Egypt, you’d bring with you one set of expectations. And these expectations would be different, if you then visited this pyramid reconstruction/revival in Las Vegas. Often, the main change you bring to a revival is a change of construction materials — new types of beads, stringing materials, closures. It’s a “Look what I can do – better, faster, cheaper!” Other changes you might bring, would be to adapt one use for another — an old brooch for a new belt buckle or pendant drop. In revivals, you preserve certain values, images, and sensibilities. And you add others more meaningful for your current situation. .the only reason I recommended shiny Delicas for the shapes when I taught is that when you’re learning, they fit together easier than matte beads. After you do your first piece, there is nothing wrong with using matte cylinder beads. Now that the book is out, several people have shown me samples made with seed beads. They are more nubbly and if one prefers this texture, it is another option. I disagree that a single thread allows you more control over tension. One should learn to get the exact tension desired using double or single thread. It is how hard you pull, not whether the thread is double or single that results in a firmer or softer piece. I do feel that if one is going to add surface embellishment, it is easier with softer tension and there is less chance of a broken bead or thread. Also, what is the real reason people prefer single over double thread? Pulling out mistakes? tangled thread? Drill down a bit and see. I am willing to have a little frustration to be sure my beadwork lasts for a very long time. As usual, it is always a matter of trade-offs. Also, I prefer Nymo or One-G because it will flatten out to allow more passes of the needle through a bead while Fireline is harder but perhaps a little more durable when it comes to working with crystals. Re thread. To date my preferred thread is doubled Nymo…well waxed with beeswax. It does come in different sizes and I will use which ever one fits best. I like to fill the bead holes with thread. Security and longevity. I always use Nymo and just use it single- I have found this to be more than strong enough and gets me the tight tension some of the more sculptural pieces need. Some of my bracelets are now 5 or so years old and have been handled by hundreds of people and worn many, many times. The triangular ones are often twisted around themselves so the points can be pointed in or out and I would have thought this is the most damaging think you can do to beadwork but none of them have ever broken. The only one that ever broken was beaded using s-lon thread and this broke almost instantly and even though it has been repaired 7+times (with the same thread) it breaks as soon as it is worn and I have given up repairing it. But this may have been a bad batch of thread? The matching bracelet was made using Nymo and has never broken despite being worn and handled an awful lot more. The main difference I have found with matte beads is that they are a lot more fragile and some of the geometric beadwork causes them to be held under tension and they break easily. I have found this to be especially true using the new size 15 delicas and have found in my work that a good 25% of them have broken as I’ve beaded- very disheartening and annoying! Even beads a few rows back can break when you think the danger time has long passed- I think this is because often the subsequent rows have a big implact on how the previous ones lie. I have matte delicas in lots of my pieces and they also help with the tension as their matte surface ‘bite’ into each other rather than slip against each other as the shiny ones do. Thank you so much for adding your comments to our blog. We started talking about your comments, and got on the subject of needles. Some people prefer the Japanese beading needles. I like a more bendable English beading needle. Connie who wrote you uses very inexpensive beading needles from India. On the geometric shapes, Connie said she bent so many needles out of shape, that she uses cheap ones. Any needle preferences? or needle strategies? I’m sure your pieces put needles to their ultimate stress tests.